In 1979 Alpro started with the production of soya drinks as a sustainable alternative for dairy products. As the trendsetter in this industry it is important to be able to operate at the highest level. "The quality of our products, and of our production processes, is of crucial importance ", according to Gert Fransen, International Quality Director with Alpro. One of Alpro’s most important production sites is in Wevelgem, Belgium. On a daily basis, Alpro soya drink is produced, packed and shipped out from here. Sustainability is in the company’s DNA. Alpro would like to improve the manner in which the world feeds itself: by creating tasty, naturally healthy plant-based foods that contribute optimally to everyone’s well-being, and that are produced with the utmost respect for our planet. They would like to contribute to plant-based food and drinks becoming mainstream. The quality that the organisation strives to achieve for its products has also been carried through to their hygiene process. Part of the hygiene process is the EWG-TAP. 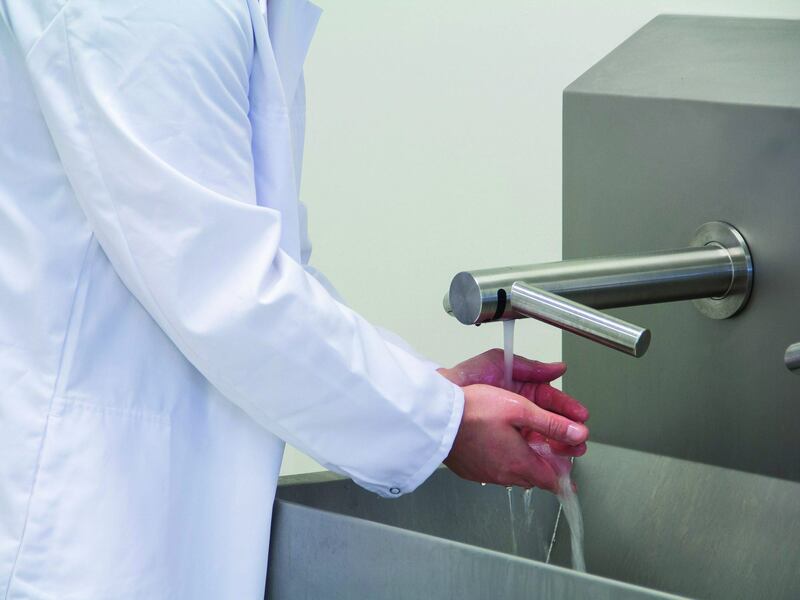 Elpress, manufacturer in the field of hygiene within the food industry, introduced last year, together with Dyson, an innovation: an ergonomic stainless-steel washbasin in combination with an integrated Dyson Airblade™ Tap hand dryer. With an integrated solution fewer actions are required and therefore the hand wash and drying process has a better and more efficient flow. In the mean time this solution has been applied many times by many companies that have strict hygiene requirements, such as the Plukon Food Group, Kellogg’s Pringles factory and Sus Campiniae. Dyson introduced the Airblade hand dryer ten years ago as a sustainable alternative for the paper towels that were at that time used almost everywhere. The use of Airblade hand dryers is still growing despite the paper industry’s resistance. “Since the introduction of the Airblade the paper industry has been trying to influence public opinion with misleading research and by questioning the Airblades hygiene”, according to Rienk Kentie, Marketing Manager for Dyson. Within the food industry this has had little impact, because experts are more inclined to be influenced by certifications such as HACCP and advice from independent experts, but within other sectors we notice that people are letting themselves be influenced by misleading information from the paper industry. In addition, research that is not financed by the paper industry has shown over and over again that Airblade technology is as hygienic as paper towels.” In terms of sustainability, however, the differences are enormous. Calculations from the Carbon Trust show that Dyson’s Airblade hand dryers produce up to 80 percent less CO2 per dry than paper towels. In addition, the savings on operational costs are significant: they can be between €1000,- and €1500,- per drying unit per year. By using Airblade™-technology, the Airblade Tap blows with a speed of 690 km/hr unheated filtered air onto the hands and literally scrapes them dry. Hands become dry in 12 seconds. Clive Withinshaw, director of food science organisation HACCP, explains: “The Dyson technology has reacted to a number of risks occurring with hand dryers in the past. The machine is easy to clean and operates without anyone needing to touch a button. In addition, it dries the hands very rapidly. Because of the integration of the HEPA filter these functions are combined to significantly reduce the risk of microbiological contamination and therefore it also complies with HACCP International’s non-food product certification scheme. The new hygiene area has been in use to our satisfaction for a year and a half. Jannes Voss, General Manager Elpress: “Our involvement with Dyson has been running for several years now. Together we would like to take hygiene to a higher level. That Alpro is satisfied with the hygiene solution is confirmation of the present quality, and a stimulant for the future.